Use the Print & Cut feature on your Silhouette to make adorable gift cards for any occasion, like these Spooktacular Halloween gift tags! Okay, that might not be controversial at all but I needed to let you know where I stand. Because candy is life. Besides coffee. But I seriously couldn’t live without either. My sweet tooth is out of control. I’m the type of person who wants others to enjoy all the delicious sweets as much as I do. And who better to push candy on than our wonderful therapists who work with the toddler on a weekly basis? Right now he gets physical, occupational, and speech therapy to help him catch up to other kids his age. Our therapists are AH-MAZING and they deserve all the praise and love from us for all that they have done for our kiddo. 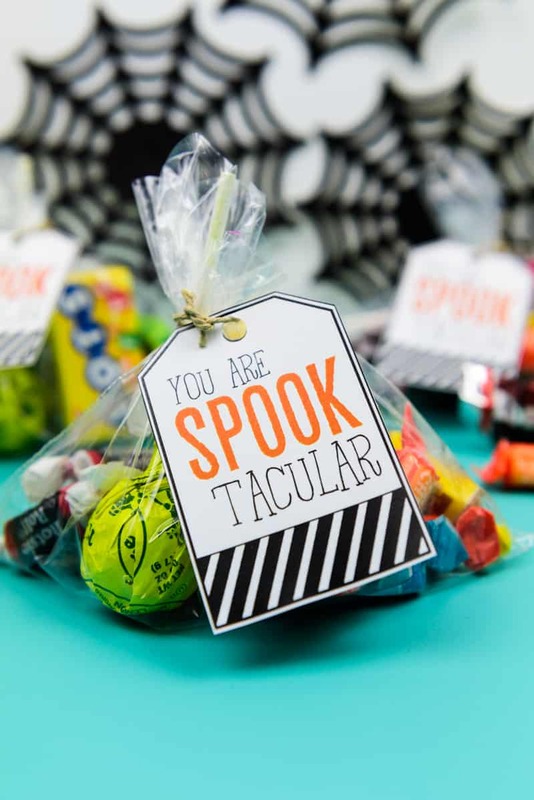 That’s the biggest reason we decided to give them a little treat this year and I made it a little more fun by topping the candy bags with the spooktacular Halloween gift tags! The biggest reason I love my Silhouette machine is because it makes me feel like a crafty goddess. I can whip up the simplest project or go all out complicated and it always looks like I spent so much time and energy coming up with what I made. Even if the project only took me 20 minutes. 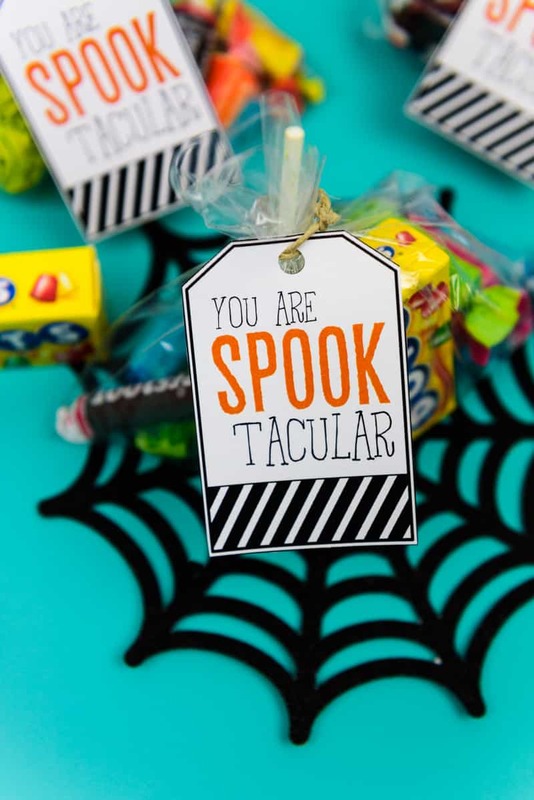 These Spook-tacular Halloween gift tags are definitely more simple, but no less fabulous. And they’re really easy to make if you know how to print and cut. But if you don’t….I’ve made a video just for you that’ll walk you through the steps to set it up in LESS THAN FIVE MINUTES! 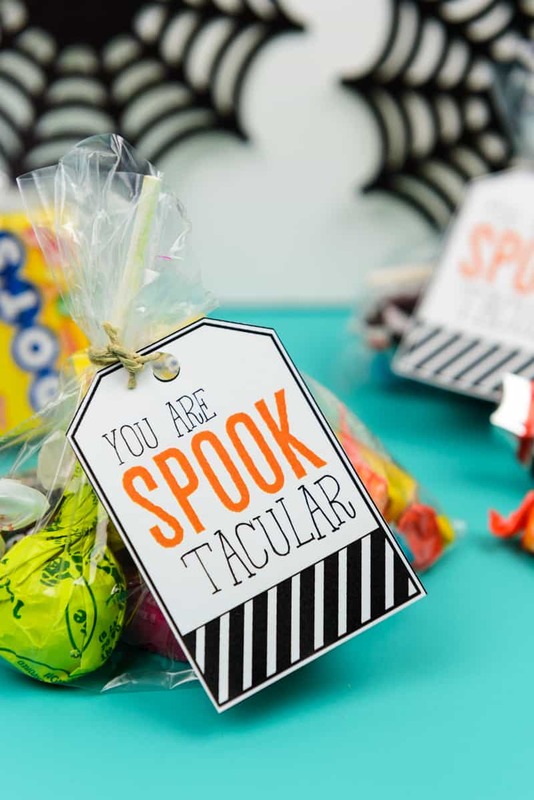 Make your own spooktacular Halloween gift tags with the Print + Cut Silhouette feature! Learn how to use the Print and Cut feature on your Silhouette Machine to make your very own Halloween gift tags! Download the free SVG file and open it in your software. Under the PAGE SETUP TAB click paper size > letter. Then turn on the print border and cut border. Under the PAGE SETUP TAB click REGISTRATION MARKS. Click style > type 1. Move the LENGTH and INSET tabs all the way to the left and the THICKNESS tab all the way to the right. Then click PRINT. Once you print your design on your piece of paper, put it on your Silhouette mat and load it into your machine. Go to SEND. Make sure you have the correct paper type and blade type selected. Also make sure that the only part of your design that is highlighted is around the outside. If you’ve checked all of that, hit CUT! I then cut the top of my sandwich ziploc bags, put candy in them, and tied it shut with string and added the Halloween gift tags! If you’re not a huge fan of reading instructions, here’s a video that’ll teach you to set up your machine to print + cut in less than 5 minutes! One thing I’m really trying to do with my toddler is teach him how and why we do things for others. It’s never too early to start showing our appreciation for others and how to DIY his own gifts. He still doesn’t quite get it but the more we talk about it and practice what we preach the faster he’ll catch on. Hey, a mom can dream. Right? If you’re on the hunt for other fun (maybe last minute?) Halloween projects, I’ve got a few good ones that will take 20 minutes or less to do!